Alicia Renadette caught my eye the first Amherst Biennial with this moving installation of a woman's torso with pieces springing out of it. She continues to mine recycled materials from family heirlooms to re-purposes materials, party favors or what ever catches her fancy in her newest installation pieces. One of which, Repeat is featured in the installation space of the new Deerfield Arts Bank and appeared in the last Amherst Biennial '12. 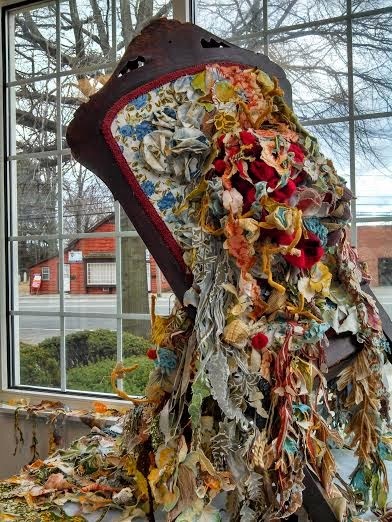 This installation utilizing her grandmother's broken chair which was revitalized with fabric, ribbons evoking the feeling of caring and playfulness in this piece. Renadette,concurrently has an exhibition at Brown University featuring Ruining Wonder. Alicia describes this project in her own words. "I am currently using materials such as holiday or "special" occasion flourishes, housekeeping implements, appliance packaging, drug-store cosmetics. Polynesian cocktail adornments and foisted family heirlooms. 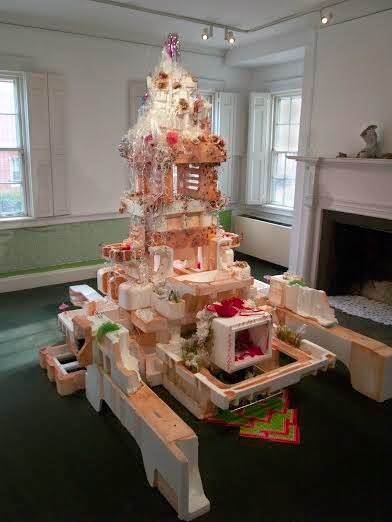 For the installation Ruining Wonder, at Sarah Doyle Gallery at Brown University, I created a structure reminiscent of a temple, parade float, or perhaps a lavish cake. Inspired by the forms and legends of the Wonders of the Ancient World. I built this piece as a sort of future-archeology. I am curious about what form object attachment and sentimentality take in the age of mass-production and planned-obsolescence. My work always aims to unravel inner-conflict. In the case of Ruining Wonder, the viewer may be immediately delighted by the celebratory decorations and find themselves seduced by the shimmering lights on what appears to be a magic castle. Once drawn in, darker themes are revealed. The initial reaction is quickly tainted. Familiar materials which were charming and whimsical now appear sinister and noxious. The surfaces appear bruised, punctured and diseased rather than merely embellished. Alicia also had a dialogue with the collection at Historic Northampton earlier this year. Reinventing items given to her from the maternal side of her family and interacting with historical items found in the collection of this historic museum. From the archive she chose three items, a bear trap, a cradle and an embroidered mourning portrait. The heirlooms she chose to interact with the collection were baby dresses worn by her mother, sisters and various items from her grandmother and great grandmother. Renadette says she animated the artifacts in unsettling scenarios....rather than to display an illusion of sentimentality.